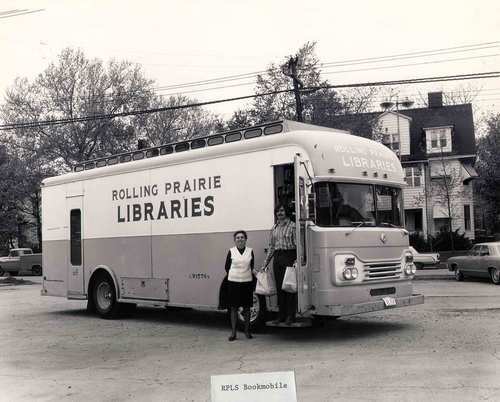 To address the problem of access, local libraries had equipped trucks with a rotating selection of books, extending their services to the outer reaches of their communities. The system was an effective deterrent to dust settling, and the cold hard statistics of borrowing from village to village could make claims for a library’s place in the world, its relevance, its use. This was especially critical during the war: as Percy Muir put it in a 1940 TLS column “The war gave...obscurantists a splendid opportunity to popularise their anti-literary bias under a patriotic camouflage” and close down libraries. But for the bookmobiles on the front lines, among other factors. Even if it is shocking to think that libraries are still under threat, it’s nothing new, and neither is the success of a little creative advocacy on their behalf: in this case what began as a lone man pushing books in a wheelbarrow through Cumberland in 1857, then a horse-drawn cart by the turn of the century, and finally a fully tax-funded scheme complete with branded vans that continues to this day. There are bookmobiles serving villages across England from Staffordshire to Cambridgeshire (UK residents, find your local bookmobile’s route here). 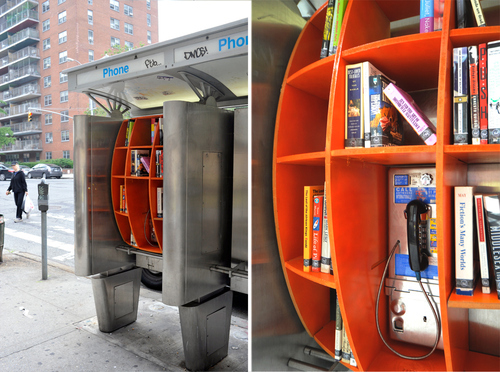 Traveling Libraries Can Fight Injustice, the old fashioned way. For instance, in Tucson, Arizona this March the ‘Librotraficante’ (‘Booktrafficker’) movement was born, a caravan of cars carrying books throughout the area’s school districts that had been banned by the Governor. The caravan handed out copies of the books that were banned, most pertaining to Mexican-American history, The Dictionary of Latino Civil Rights History, Rethinking Columbus, but also other works such as bell hooks’ Feminism is for Everyone and Howard Zinn’s People’s History of the United States. If libraries exist to provide free services to those least likely to have access to information, traveling libraries have the unique ability to reach audiences whose resources have been cut off. Not Everyone Has Computer Access, let alone the luxury of travel by car. 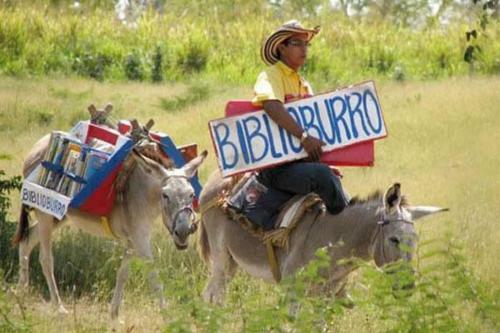 Luis Soriano Borges takes his “bibliodonkeys” Alfa and Beto through the mountain villages of Columbia to bring books to children. In Kenya, the mobile library is powered by Camels. Unconventional Approaches Have Lasting Effects. The itinerant library is something of a spiritual reminder that the library as a communal space can lead anywhere, as long as it leads to anyone. But its dependence on petrol makes it a little easier to comprehend than Borges’ limitless library “whose circumference is inaccessible”. The future is a little more concrete. In Argentina Raul Lemesoff’s “Weapon of Mass Instruction”, a mobile library that looks like a tank with space for 900 books provide free reads - with a pacifist message - to anyone he meets. Some kids pick up a love of reading early in life when they find a story that really grabs their attention...others will be lifelong readers after a run-in with a tank on the streets of Buenos Aries. To address the problem of access, local libraries had equipped trucks with a rotating selection of books, extending their services to the outer reaches of their communities. The system was an effective deterrent to dust settling, and the cold hard statistics of borrowing from village to village could make claims for a library's place in the world, its relevance, its use. This was especially critical during the war: as Percy Muir put it in a 1940 TLS column "The war gave...obscurantists a splendid opportunity to popularise their anti-literary bias under a patriotic camouflage" and close down libraries. But for the bookmobiles on the front lines, among other factors. Even if it is shocking to think that libraries are still under threat, it's nothing new, and neither is the success of a little creative advocacy on their behalf: in this case what began as a lone man pushing books in a wheelbarrow through Cumberland in 1857, then a horse-drawn cart by the turn of the century, and finally a fully tax-funded scheme complete with branded vans that continues to this day. There are bookmobiles serving villages across England from Staffordshire to Cambridgeshire (UK residents, find your local bookmobile's route here). 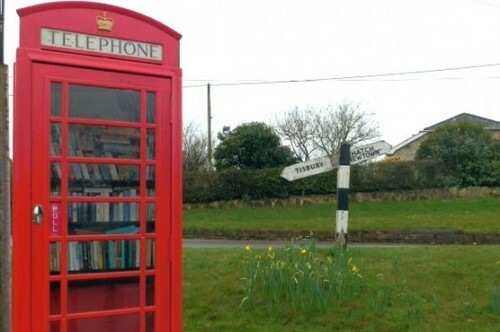 Traveling Libraries Can Fight Injustice, the old fashioned way. For instance, in Tucson, Arizona this March the 'Librotraficante' ('Booktrafficker') movement was born, a caravan of cars carrying books throughout the area's school districts that had been banned by the Governor. The caravan handed out copies of the books that were banned, most pertaining to Mexican-American history, The Dictionary of Latino Civil Rights History, Rethinking Columbus, but also other works such as bell hooks' Feminism is for Everyone and Howard Zinn's People's History of the United States. If libraries exist to provide free services to those least likely to have access to information, traveling libraries have the unique ability to reach audiences whose resources have been cut off. Not Everyone Has Computer Access, let alone the luxury of travel by car. Luis Soriano Borges takes his "bibliodonkeys" Alfa and Beto through the mountain villages of Columbia to bring books to children. In Kenya, the mobile library is powered by Camels. Unconventional Approaches Have Lasting Effects. The itinerant library is something of a spiritual reminder that the library as a communal space can lead anywhere, as long as it leads to anyone. But its dependence on petrol makes it a little easier to comprehend than Borges' limitless library "whose circumference is inaccessible". The future is a little more concrete. 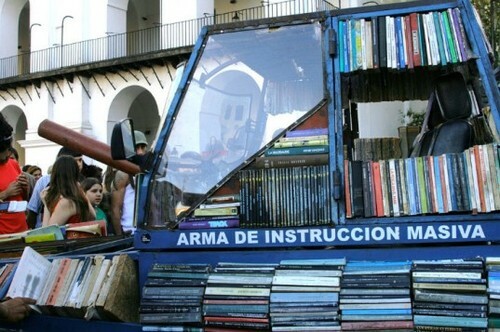 In Argentina Raul Lemesoff's "Weapon of Mass Instruction", a mobile library that looks like a tank with space for 900 books provide free reads - with a pacifist message - to anyone he meets. Some kids pick up a love of reading early in life when they find a story that really grabs their attention...others will be lifelong readers after a run-in with a tank on the streets of Buenos Aries. Ditto Tom Corwin's refurbishment and revival of an old American bookmobile. Chasing a bookmobile down the street rather than an Ice Cream truck could raise the next generation of book collectors as well as keep us well in touch with the history of access in all its aspects, positive and negative. Corwin has already reconnected with the history of his truck's influence, according to an article in the Smithsonian: "As Corwin navigated his new ride through the streets of Chicago, he was approached by an African-American man who asked if it was possible to peak inside. 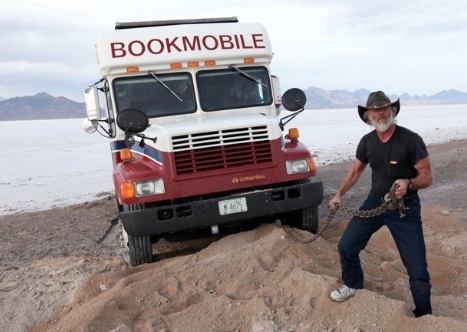 Bookmobiles, he said, had been a fundamental inspiration while growing up in rural Mississippi in the mid-1960s. The public library had been closed to blacks - but the bookmobile stopped right on his street, a portal into the world of literature. The man was W. Ralph Eubanks: today an acclaimed author, and director of publishing for the Library of Congress."